Released on the Sega Saturn in 1995 Sega Rally Championship was the first game that made me believe the future had arrived. Before it I was used to playing Outrun or Micro Machines…but here was this gorgeous arcade racer that allowed you, the player, to drive on different surfaces. 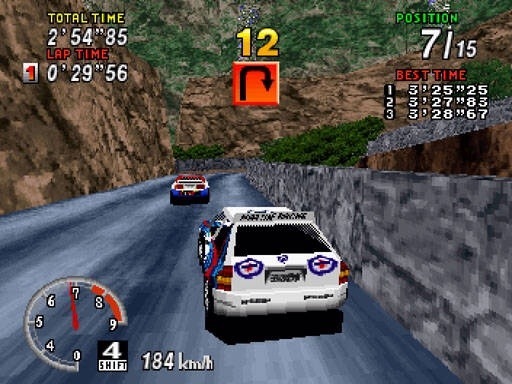 Seeing mud splash up across the car as you drove through patches of it all the while struggling to keep control of the car ranks up there as one of my best Sega Saturn memories of which there are too few. Take away the memories & Sega Rally is as bare-bones as you get…. You enter a ‘World Championship’ made up of 3; yes that’s right 3 stages. Desert is the opening stage (Beginner) followed by Forest (Intermediate) before Mountain (Expert) caps it off. The ending position of the last race determines the starting of the next with the aim to be in first place by the end of the final race. Additional challenge comes from a time limit but should you be successful you will unlock an additional race called Lakeside. As well as World Championship there is also a Time Attack mode, co-operative play & competitive multi-player (split-screen). These modes managed to extend the gameplay somewhat but with only 3 cars to choose from it’s not long before you’ve played every race, in every mode with every car. In this day & age such a lack of content would be totally unacceptable but Sega Rally is an arcade port when arcade machines were considered important & popular. It’s easy to look back & say, unacceptable but its better to acknowledge just how far racing games have come. 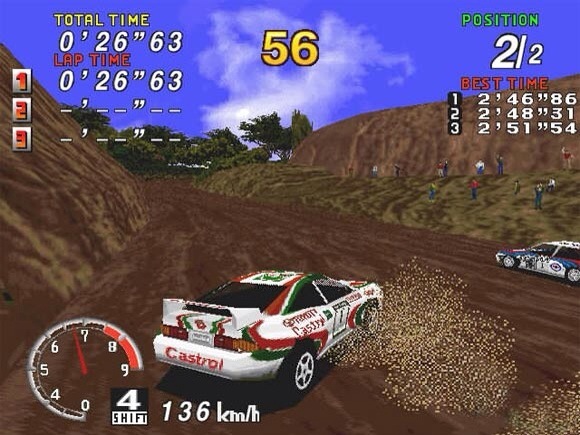 Sega Rally was a milestone in racing games in that the surface textures affecting how the vehicle handled. What Colin McRae Rally (What I consider to be my favourite rally game from yester-year) did many years later. It’s looking a bit ropey by today’s standards & the total lack of content doesn’t seem right even for a game from 1995. It is though, a really good rally game that set the bar high for every racing game that came after.